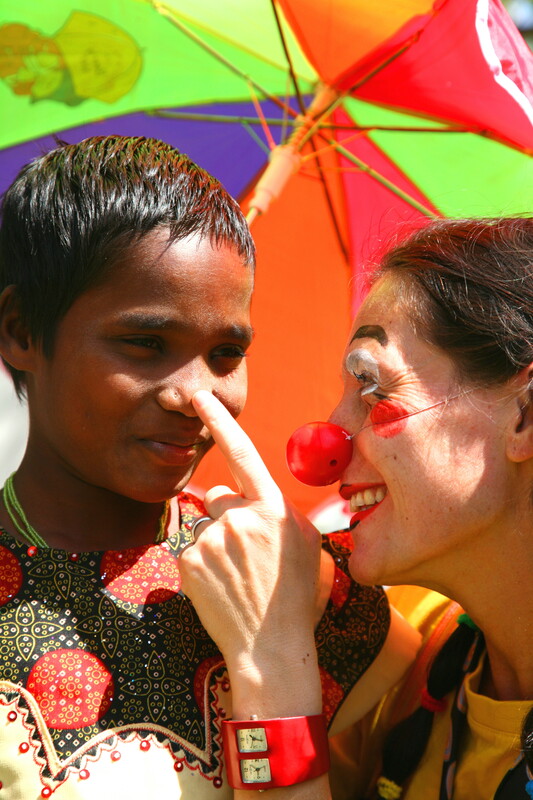 Once upon a time, one red nose found herself rolling, rolling, rolling - all the way from Lyons in France, to Bangalore, India. When her journey was done, Miss Rose picked herself up, dusted herself off, and looked around. "Hmm," she thought (in French, of course). "I seem to be the only clown in town. Where are all the others hiding?" So she set about searching for all the magical clowns she could find in Bangalore. She found one, and then another, and another. She told her new friends about the special work that the clowns in France were doing, distributing healthy doses of smiles, giggles and guffaws of laughter to children in hospital. "Ooh!" said one clown (in Kannada). "That sounds like fun!" said another (in Urdu). And that's how Docteur Clown India was born! So if you happen to bump into a red nose anywhere in Bangalore, you can be sure it's one of us - stop and say hello!